Our group focuses on research, development and implementation of advanced digital signal processing algorithms, mainly in the fields of adaptive control and audio processing. We build on our experience with statistics, namely with the Bayesian approach to system identification and modeling, as well as the relevant fields of linear algebra. We have presented our recent results at the EW 2019 exhibition held in Nuremberg from 26 to 28 February 2019. At the TRENZ Electronics company booth, we have demonstrated work related to ECSEL projects: Productive 4.0 Arrow Head Framework Demo on Trenz Electronic TE0820 and TE0726 boards, FitOptiVis Dynamic HW Reconfiguration on Xilinx ZynqMP TE0820-03-3EG-1EA module, SILENSE SciLab 5.5.2 Interpreter on Xilinx Zynq Ultrascale+ XCZU4EV and WAKeMeUP Field Oriented Control (FOC) of BL-DC motor on Trenz Electronic TE0720-03-2IF module with TEC0053-04 power PCB. See some photos from the booth. SILENSE newsletter presents an actual information about the project progress. The first project newsletter from May 2018 focused on application of ultrasound for underwater communication and localization in wearables domain. The recently published October 2018 issue gives an insight into the applications of ultrasound technology in automotive domain, especially in personal cars. You can also subscribe to the newsletter on the SILENSE project website. An article about our research and development in the frame of SILENSE project has been published in the Czech Academy of Sciences magazine. See Veda a vyzkum 2/2018, page 64 – 67. Research and development results of our department have been presented at the Productive 4.0 project portal. See article about Further progress in innovative IoT-enabling components . Zveme Vás na expertní seminář organizovaný v rámci projektu Adaptace člověka na asistenční systémy pro řidiče (TA ČR). Zapojte se do diskuze a přispějte k co nejlepšímu uplatnění výsledků projektu v praxi. Seminář se uskuteční dne 8.12.2017 v prostorách ÚTIA AV ČR v Praze. 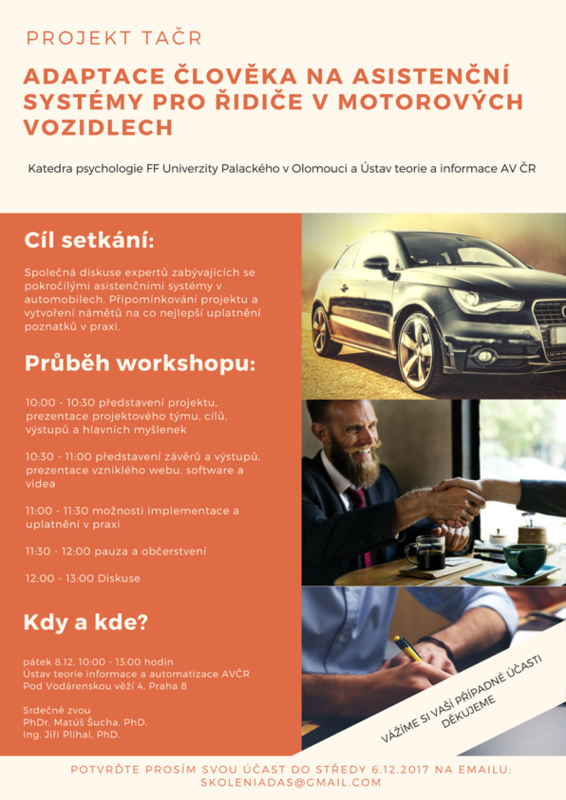 Společně pořádá Katedra psychologie FF University Palackého v Olomouci a ÚTIA AV ČR, v.v.i. Přihlášky zasílejte do 6.12. na tento email. V případě dotazů se obraťte na Dr.-Ing. Jiřího Plíhala. Zveme Vás na školení pro řidiče i všechny zájemce o moderní automobilové technologie. Naučte se plně využít výhod asistenčních systémů a minimalizovat rizika. Školení proběhne 24. 11. 2017 v Olomouci a 1. 12. 2017 v Brně. Organizuje Katedra psychologie Filozofické fakulty University Palackého v Olomouci a ÚTIA AV ČR, v.v.i.